Boho would probably be the last word I'd use to describe my personal style, but I just got that kind of vibe from this LAmade shirt and couldn't help give it a 70s look. If I owned wide-leg jeans (which I totally would if it were possible to find a pair for someone so short!) they would've been ideal to really give this hippie feel. Of course, I can't stray too far from what I'm used to and offset the look with a studded bag. Still, I have to say -- I'm kinda digging the free love, flower-crown wearing, laid back attitude that comes with a boho-inspired outfit! And it just goes to show that trying new things and styles can easily work with your personal style. 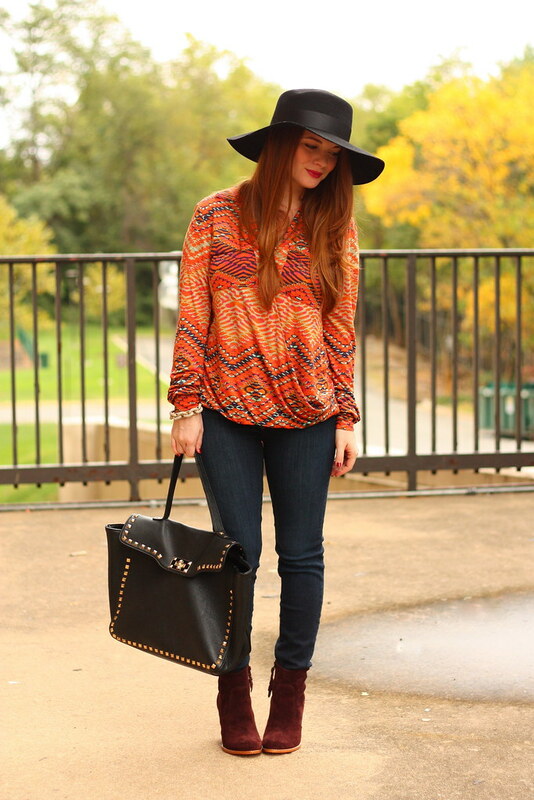 You pull this look off so well - loving the hat and those booties are gorgeous!! You don't need wide leg pants to pull off the boho look! You did it perfectly already. I'm glad you are back, I always find myself replicating your looks they are very easy to fall in love with. You look fabulous! 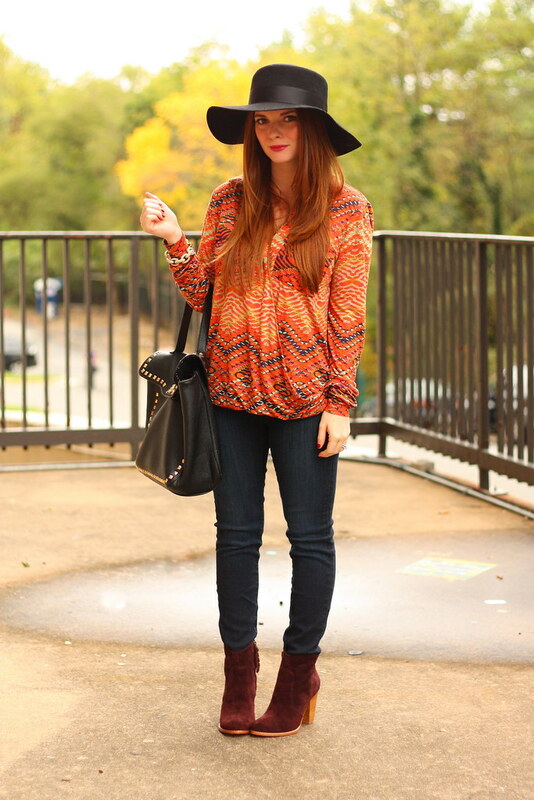 Love the print and vibrant colors of that top and those booties in the maroon... perfect pair! The print on that top is lovely! The pink and the blue in there really makes it pop. LOVE how you've got some edge in there with the purse, to balance things out. 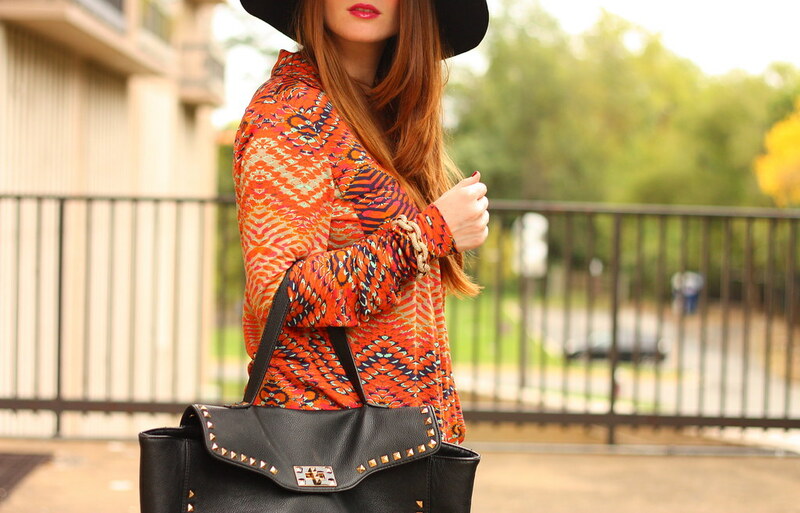 This hat looks fab on you-- and I am loving the fall colors in your photos! Gorgeous top. Love the colors for fall. Such a cute look. I love the shirt and hat - great fall colors too! I love the print to your blouse! It has a very Rachel Zoe feel to it.